Lions, tigers, and bears (oh my! ), some of the most popular animals to pay and take a picture holding or feeding a bottle. Their symbolism of strength, power, wildness, and beauty is mesmerizing and irresistible. It is hard to believe there is anything cuter than a tiny baby lion or tiger in this world, and it is hard to pass up an opportunity to get as close as possible. “Tiger selfies” are in high demand and one of the most popular exotic tourist attraction in the United States. Pictures and videos show off a few minutes interaction with an adorable baby or depict celebrities notoriously posting pictures of their “wild” encounters. What animal loving patrons do not understand is that this industry is not as cute and cuddly as it seems. There is so much more behind the scenes than posing for a picture with exotic animals. Exotic animal cubs are heavily overexploited and overbred due to the extreme desire to view their cuteness. There are no “behind the scene” episodes of where the animals come from, or what happens when they grow into powerful apex predators. If the public knew that “liking” these videos, following baby animal posts, or actually visiting a place to play with cubs was actually harming them, would they still be so popular? This is the information that every big cat lover needs to know. There is a deep dark side of what happens to cubs after a quick interaction that the exploiters do not want to expose due to their high money making scheme. Most patrons are not aware of the underlying problems, abuse, and neglect these animals endure for a lifetime. They believe that they are truly helping to conserve the species and expressing their love for tigers and lions through interaction. This trend is causing thousands of big cats and exotic animals to suffer throughout the country. 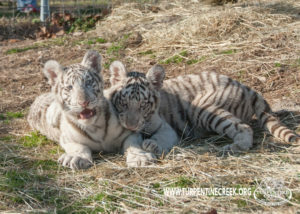 Turpentine Creek Wildlife Refuge has provided an in-depth educational piece about cub petting and pay to play schemes. 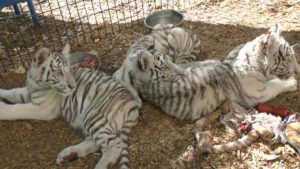 Cub petting and pay to play schemes are some of the most popular interactive tourist attractions in the United States where animals are exploited. Animal-loving patrons are fooled into thinking they are helping with conservation or feeding an abandoned cub, and tricked into supporting cruel practices. Cubs are stripped away from their mothers at birth, malnourished, sleep deprived, and lack proper veterinary care. They are starved in order for them to be hungry for the next picture. Babies are only allowed to be held from 8-12 weeks old legally. Mothers are constantly bred to keep up with this window when in the wild they would only have cubs every 2-3 years. Breeding generic tigers and other exotic animals in captivity does not help with their conservation or save them from going extinct. 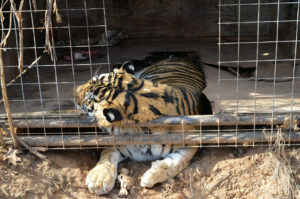 Breeding actually causes a surplus of adult dangerous exotic animals, who are euthanized once grown and unprofitable or sold to roadside zoos and circuses to live a life full of exploitation and abuse. Very few big cats are fortunate enough to be rescued at a true sanctuary. Are a few minutes of play and a photo worth a lifetime of suffering for a big cat? Cubs are stripped away from their mothers at birth, when they are usually weaned at 6 months of age in the wild, depending on the calcium-rich milk to develop properly. Cubs spend 2-3 years with their mothers learning how to be a tiger and survive on their own in the wild. Instead, cub petting facilities take away babies prematurely so the mother can go into heat right away and produce more babies. Young cubs are easily susceptible to calcium deficiencies because of this and develop lifelong health defects such as metabolic bone disease. This causes brittle bones, development issues, and may become so severe to take the cub’s life. To ensure the cub will be hungry for the photo shoot, they have food withheld from them and are starved until someone comes to pay and bottle feed them. Young babies are deprived of sleep so tourists can repeatedly take their picture. Handlers spank, yell, scruff, and manipulate babies to get them to behave a certain way. They are constantly disciplined for performing natural behaviors for a baby big cat. They are born into a lifetime of stress with no relief, being exploited for financial gain. There are over 33 facilities within the United States, as well as many more international cub petting facilities. Exhibitors can make roughly $30,000 a week for cub photo opportunities, treating the animals as props rather than living beings. Money, as well as breeding, drives the industry to meet the high demand of cub holding at the expense of the animals’ welfare. For each facility to sustain their business, they would need to provide 200 cubs each year for petting. This very small window of breeding opportunity creates rampant breeding of females, just as a dog in a puppy mill. For this industry to thrive, there needs to be a constant flow of cubs within a 4-week age bracket. Click here to watch an Undercover Investigations Reveal Abuse of Tiger Cubs at Roadside Zoos (The Humane Society of the United States). Per USDA regulations young exotic cubs such as tigers and lions are only allowed to be handled by the public from 8-12 weeks of age, providing a legal 4-week window to exploit the babies. They are hungry, tired, and forced to constantly be handled by the public for photo shoots. The USDA Animal and Plant Health Inspection Service (APHIS) states that they cannot be handled by the public before 8 weeks because they have not developed a healthy immune system, and at 12 weeks they become too dangerous for the public. What happens when the cub gets too big? There is no tracking of these animals if not given a census to the USDA. It is required for exhibitors to keep a census of animal, but is not submitted to the USDA until they are able to visit the facility. Due to the limited number of inspectors, it is easy for exhibitors to forge paperwork or simply not put a cub on a census that has died or been sold. One of the most notorious cub petting facilities produced dozens of cubs for their cub petting scheme. However, his census over a 5-year span only increased by 10 tigers. What happened to the rest of them? After this age window, what happens to the cubs that at 12 weeks old, are considered too dangerous? The USDA regulates these cub petting facilities, but age distinction is difficult and they do not have big cat experts regulating attractions. Rachel Hartigan Shea of National Geographic stated in her article “Are Wildlife Sanctuaries Good for Animals?” that “… private sanctuaries that don’t exhibit animals aren’t regulated by the federal government”(2014). Cats are easily used passed their age restrictions, sedated so they do not bite the public, or stored away in cages when no longer useful. Many are euthanized because they are not profitable, sold to roadside zoos, circuses, and hunting ranches to be further exploited. The overpopulation of these big cats results in inhumane treatment, unsuitable living conditions, and abuse at all stages of the animal’s life. A small amount of abused and neglected big cats are fortunate to end up in an accredited sanctuary with a forever home. There are not enough accredited facilities that can accommodate the extreme amount of tigers as well as other cubs that have outgrown their 12-week window. True sanctuaries are already overrun with neglected and abandoned animals, and it is extremely expensive to continually rescue them and provide them with forever care. Most are non-profits, depending on public donations to fund the sanctuary and rescue more animals. Big cats can live to be 20 years old in captivity, and bears can live to be 35-40 years old, and true sanctuaries become a forever home for each animal. This is many years past this 8-12-week window in which animals can be held for photography and playing opportunities. True sanctuaries accredited and verified by the Global Federation of Animal Sanctuaries (GFAS) work together to find permanent homes for animals that can be rescued. Unfortunately for many animals, the surplus animals are euthanized by their exploiter, sold for their body parts on the illegal market, or circulated within the unregulated exotic pet trade and canned hunting enterprises, as mentioned by Carson Barylak, Campaign Officer for the International Fund for Animal Welfare (IFAW). In her article ACTION NEEDED: USDA again considering ban on big cat handling. Barylak’s plea is to ban public contact to reduce the incentive for excess breeding, and problems associated with pay to play schemes (2016). 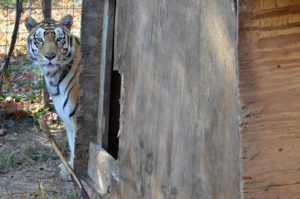 In a single case, 90 tigers were found dead and more clinging to life, abandoned by their cub petting handler and exhibitor in California, stated in The Big Cat Handling Crisis provided by Big Cat Rescue, Born Free USA, The Humane Society of the United States, Ian Somerhalder Foundation, International Fund for Animal Welfare, and World Wildlife Fund. This fact sheet dives into the emotional pain and physical stress when cubs are stripped away from their mothers, confined in small cages, transported from location to location, and constantly handled by strangers. Their need for sleep as babies is disrupted and causes them stress, induces diarrhea, and they are physically abused if they do not act a certain way. There are numerous safety risks involved for cub petting for not only the animals being handled, but also the general public who comes into contact with cubs. It is possible to pass on zoonotic diseases from sickly cubs to humans. Cubs are given vaccinations just as our animals at home from 8-16 weeks of age. There are no vaccines for exotic animals such as big cats for rabies, and if they are to bite someone they are decapitated to test for rabies. Breeding endangered species in captivity and allowing them to be handled for photos and played with for entertainment is NOT helping their conservation. It is deferring from the reality of the diminishing wild populations, and encourages the rampant breeding of inbred animals in captivity. Breeding generic tigers in captive situations is not preventing them from going extinct in the wild. It misleads patrons into thinking they are helping with conservation, and takes away valuable education and funds away from endangered species. It would be a death sentence to walk up to a tiger mother and try and pet or handle her cubs. Petting and handling a cub has no benefit for that animal, and if not bred and exploited for profit, would never be touched by human hands. It solely benefits the human who is participating in the petting and satisfying personal desires to touch a wild animal. Conservation should be viewed as how an action is benefiting the animal and its future populations. Cub petting does the exact opposite when they habituate an animal who does not naturally have human interaction. Extremely deceitful tactics are used to make money off hopeful citizens, wanting to interact with the animals and also help save them. Choosing to admire big cats from a distance and support true sanctuaries and conservation entities is what is truly making a difference for captive and wild exotic animals. Having a close encounter with an endangered species, such as cub petting, does not strengthen the willingness to take action and support conservation. It decreases concern for the overall wellbeing of the species, and desensitizes the true problems they are facing in the wild. Treating wild animals as props or pets is the taking away their value as a wild, apex predator, and the reason why there are so many tigers and lions suffering in captivity. Generic exotic animals also do not help with conservation, as they are captive the rest of their lives and have no generic purity. Breeding them does not save them from extinction. You cannot release an animal bred in captivity back into the wild because they cannot fend for themselves, their mothers did not teach them how to survive. They have also been so carelessly bred, that due to inbreeding and health issues, would devastate wild populations even more. Pseudo (fake) sanctuaries, breeding facilities as well as cub petting rings claim to be helping with conservation and rescuing animals as a sanctuary. They will also say that the animal enjoys being handled, performing, and interaction with humans. THEY DO NOT! It is not true that breeding big cats or any other species in captivity is helping with conservation, because they are NOT released into the wild. These animals will remain in captivity and in cages for the rest of their lives, which is not promoting protection, animal welfare, or conservation of these animals. It is just the easiest way for these businesses to trick the public into spending their money, and believing that they are helping these amazing animals. The International Fund for Animal Welfare (IFAW) in coalition with World Wildlife Fund (WWF), The Global Federation of Animal Sanctuaries (GFAS), Humane Society of the United States (HSUS), Born Free USA (BFUSA), The Fund for Animals (“The Fund”) and Big Cat Rescue (BCR, “Petitioners”) submitted a petition to the USDA Department of Agriculture March 31, 2015 to prohibit public contact with big cats, bears and non-human primates. In summary, the petition declares that handling of these species is unsafe, inhumane, and should be prohibited regardless of licensing status and age of the animal. The petition also states that allowing handling of these animals is undermining efforts to conserve endangered species. Tell Congress to Protect Big Cats! A quick note to them can help protect big cats throughout the country. There should be no acceptable age limit for cubs to be in contact with humans, and the USDA should ban the cub petting industry and disallow breeding of generic tigers in captivity. Closing the age loophole would be a huge breakthrough in ending the cub petting epidemic. The USDA rule is interpretive, and can be easily reversed by requiring cubs to be a safe distance from the public. Be their voice and share with others what you have learned to protect more animals in the future. Please do not participate in pay to play schemes, and educate others to not support the abuse and exploitation of exotic animals. Together, we can make a difference! For big cat lovers, there is a safe and beneficial alternative to help victims of the exotic animal trade and cub petting industry. Visit true sanctuaries that do not buy, sell, breed, or trade animals and provide them with a forever home. It is much more satisfying to know that the admission fees are going to help protect the animals from further exploitation and neglect. To see the big cats running around in large grassy habitats and playing with enrichment toys, to have a life they deserve. 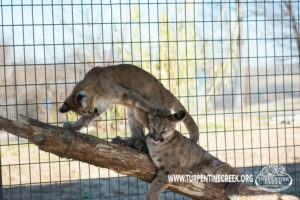 Turpentine Creek Wildlife Refuge has rescued abused, abandoned, neglected, and unwanted big cats and other exotic animals for 25 years. Not only will TCWR continue to provide Refuge for these animals, but continue to strive to educate every visitor to become an animal advocate and fight against the problem. Make a difference by supporting true sanctuaries and not visiting pseudo sanctuaries or contributing to pay to play schemes. Together we can make a difference! Thank you for your continued support and “Helping Us, Help Them!”.